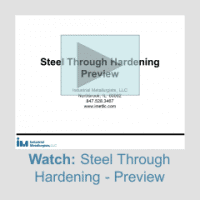 If your products use through hardened steel components, a good understanding of the metallurgy of steel through hardening is critical for being more productive and profitable. Quenching and tempering, martempering, and austempering through hardening process conditions. Common through hardening problems and how to avoid them. Effects of tempering temperature and time on steel microstructure, strength, and hardness. Effects of steel composition on hardenability and how to read a hardenability curve. Principles of Metallurgy and Metallurgy of Steel or knowledge of the following: diffusion, metallurgical phase, grain, steel phases and their microstructures, iron-carbon phase diagram, and the effects of cooling rate on steel microstructure.